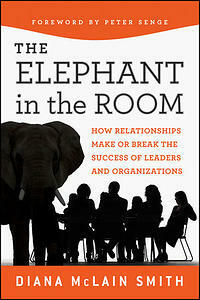 Senior leadership & team development advisor, & author of several books including, The Elephant in the Room. ① Do You Know How to Master the Elephant in the Room? Those who succeed in today’s faster, flatter world will be those who get their relationships right, not just their strategies. Still, after a hundred years of research into how individuals and organizations tick, we know nothing systematic or even useful about how relationships affect the success of leaders and organizations. If anything, relationships at the top of the firm are the big undiscussable—the one topic everyone knows how to avoid, but no one knows how to master or put to work. As a result, relationships at the top all too often destroy far more value than they create. This program uses stories, exercises, and research to help leaders identify, strengthen, and harness relationships key to their success. We’ve all seen the pattern. Just as quickly as one leader or group proposes a new idea, another disposes of it. Soon the two are locked in a point-counterpoint debate over whether the idea will work, whether it is “on strategy,” and whether its potential risks outweigh its potential benefits. With only past data to predict future events, debates over new ideas resist resolution on the merits, often turning debates into personal squabbles that stifle or stall important innovations. This program shows you how to harness disagreements over future events to come up with better ideas and capture their potential. Diana Smith is Chief Executive Partner at New Profit Inc., a venture philanthropy firm that harnesses America’s entrepreneurial spirit to break down entrenched barriers to social mobility. For the past two years, Diana has used her ideas at New Profit to transform the firm’s culture and accelerate its growth. 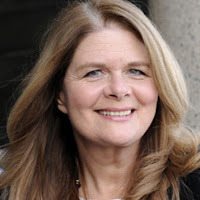 Diana previously served as a partner and thought leader at the Monitor Group, a global management consultancy, and she is co-founder of Action Design, a firm that specializes in professional and organizational learning. She earned her master’s and doctoral degrees in consulting psychology at Harvard University. 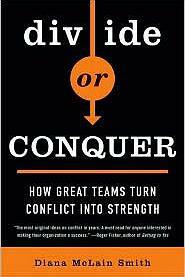 She is the author of Divide or Conquer: How Great Teams Turn Conflict into Strength and, most recently, The Elephant in the Room: How Relationships Make or Break the Success of Leaders and Organizations.